The Remodeling Project involved the updating renovation of this 36 year old Kitchen with the inclusion of a three season room. The existing kitchen was centralized between the foyer, dining room, family room, back hall entrance from the garage and guest bath. 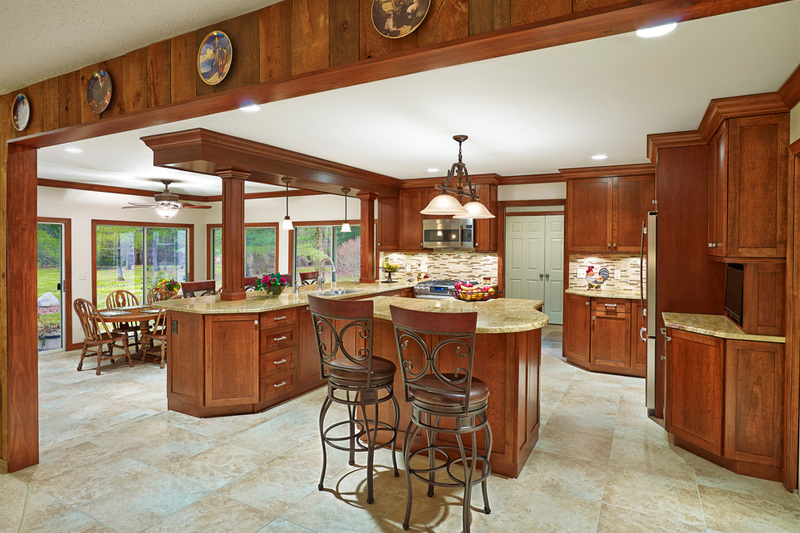 A centralized kitchen with entrances from five traffic pattern areas creates for a challenging design solution. The existing kitchen needed a fresh new design appeal to allow a more spacious look while creating a cozy two person breakfast area along with being entertainment friendly and to meet the Homeowner’s gourmet needs. With the inclusion of an unheated three season room to become the main informal dining and entertainment areas this helped create a more defined kitchen area. What was also evident was the desire to allow more natural light into the kitchen which was severely lacking, however, the rear window wall was an exterior bearing wall. The challenge was to eliminate the wall without creating an “add on look” and ceilings which were not level and contiguous. The architectural approach had to incorporate a user friendly kitchen and simultaneously serve as the dramatic centerpiece of a spacious and functional open floor plan while staying within the “Green Building” concept. The existing kitchen was totally demolished including the bearing wall to the exterior. This allowed for a new open space within which to redesign by utilizing a structural LVL beam system with two support columns, one hidden in a wall and the other camouflaged as an aesthetically pleasing wood column feature. Extra space was added to the kitchen by the renovation of a four season room with an entertainment bar and creating a large island feature which has a perfect breakfast area for these empty nesters. The exterior walls had the concrete floor removed to install heat and cooling ducts extending from the main house HVAC system. Custom cabinetry, counter tops, and the island were redefined to create the new kitchen as the centralized point. This provided dramatic staging for entertaining and a discreet “backstage” access to the guest bath and guest service entry. The architect designed a dropped soffit above the island to hide the structural beam while encasing it with fine millwork details mirroring the peninsula below. The additional natural light was achieved by introducing the now four season breakfast room with its four full glass patio doors overlooking this open kitchen. Indirect and direct artificial lighting was added throughout utilizing the dropped soffit and island pendant lights, the lighted glass door cabinetry display and under-cabinet lighting. The food preparation space was designed for the chef to have continuous contact with guests enabling the guests to feel comfortable as they enjoy the personal attention and the dramatic views thereby creating a true entertaining delight. The remodeled kitchen now appears immensely larger by removing the rear kitchen wall and reconfiguring the work space providing a great entertainment atmosphere. Indirect lighting above and below the cabinets provides a bright comfortable work area and a soft elegant ambience when desired. The deep exotic wood grained cabinetry, two levels of granite counter tops, the complimenting porcelain tile flooring and the contrasting glass mosaic tile backsplash accents provide the look of a fine showroom while maintaining the comfortable and warm feeling of home. “For A Home You Will Love” truly reveals the way this Homeowner feels.